strategies pays dividends for expanding companies. HME is a steel fabrication company that has added 40 workers and grown to 40,000 sq. ft. of total facility space over the past five years in Topeka. The unique stairway below is one of the many products manufactured at the company’s plant in the capital city of Kansas. ntrepreneurial companies launched in Topeka, Kan., are testing the normal limits of growth by turning their manufacturing plants into idea factories. At places like Display Solutions of Topeka LLC and HME Inc., innovation is the seed capital driving facility and work-force expansion. Display Solutions and HME participated in one of four Innovation Jump Starts offered in Topeka this year under the auspices of the Greater Topeka Chamber of Commerce/GO Topeka economic development initiative and facilitated by Mid-America Manufacturing Technology Center (MAMTC). "This program helps small manufacturers like ours innovate and grow," says Scott Johnson, president and general manager of Display Solutions. "They take a mixture of management and shop people and put you in a room all day to come up with ideas. They put you on the clock, and at the end of the day you actually vote on the ideas." Johnson’s firm manufactures the doors that roll down in front of gun shops to provide greater retail security. "When a gun store gets robbed, it’s usually a smash-and-grab. We developed a bunch of security cases to stop this crime," he says. "We are the only company out there doing this." Starting with just four employees and 2,000 sq. ft. (186 sq. m.) of shop space two years ago, Display Solutions now employs 12 workers in a 40,000-sq.-ft. (3,716-sq.-m.) plant in Topeka. "We are a totally automated shop now, and we will be expanding again," Johnson says. "We are a growing company. We have tripled in size, and if the economy improves — and I believe it will — we will grow to about 45 employees." Johnson credits the innovation program with "opening our eyes to a lot of possibilities. The folks that run that program are very knowledgeable people. They make it a fun thing. By noon, everybody with our firm was really into it." The firm generated more than 100 new ideas for innovation during this exercise, including the creation of a new Web site. To date, more than $100,000 in bids have been placed on fulfillment of new products that came out of the idea session. Johnson also credits a lot of his company’s success to its Topeka location. "We are centrally located in the U.S. When you do what we do, you have to be able to ship these cabinets and fixtures coast to coast," he notes. "We can be competitive with anybody because of our central U.S. location. We also have a lot of vocational-technical schools here, so a lot of kids are being exposed to woodworking. They don’t teach that in high school anymore, and the technical schools in this area are doing a great job." Kevin Rake, controller of HME, says the innovation program "helped us think big picture. We made some pretty good strides by being forced to think long-term about our online sales and vertical sales." HME is a steel fabrication company that supplies structural steel to general contractors that build schools, banks and government buildings. "We have been located in Topeka since 1996 and we employ over 100 people," says Rake. "Over the past five years, we have added 40 workers and grown from 25,000 square feet [2,323 sq. m.] to about 40,000 square feet [3,716 sq. m.] in three buildings." Access to suppliers makes Topeka a prime business location for HME, says Rake. "The cost of doing business here is very low, and that helps keep our freight rates lower. There is a pretty good labor pool here. There is no shortage of certified welders and other skilled workers in the area. GO Topeka, Shawnee County and the state offered excellent incentives for us to grow, and our central location in Kansas enables us to have access to a good source of materials from Arkansas, Texas and Nebraska." HME developed 65 separate ideas during the innovation session, including a new targeted marketing campaign and an improved company Web site. Rake points out that constant innovation is key because "steel is a pretty old product. That is why we must always look at internal innovation of our processes to make sure that we are doing things better." Thanks to a grant just awarded to Topeka, innovation at area factories and logistics operations could soon be taking yet another step forward. A coalition of local partners has been awarded $500,000 from the National Institutes of Standards and Technology’s Manufacturing Extension Partnership Program (NIST-MEP) as part of a $1.1-million project to promote innovation and competitiveness in the Topeka area. The Topeka Chamber/GO Topeka, Washburn University, the MAMTC, the National Growth Through Innovation Foundation and the Eureka! Ranch will manage the program — called "Innovation in Manufacturing and the Supply Chain" — over the next two years. The project will increase corporate growth and innovation in the Topeka area by increasing collaboration between original equipment manufacturers, suppliers, inventors, community leaders and universities to optimize technology and stimulate economic expansion. "The ultimate goal is to create a unique, distinctive competitive advantage for the Topeka area by supporting greater retention and expansion of current businesses while attracting new jobs and investments," says Steve Jenkins, senior vice president of economic development for the chamber and GO Topeka. "It will feed into our program to develop a more efficient work environment and will promote work-force development for our community." Jenkins notes that of the companies that participated in the pilot programs this past year, "the least amount of new ideas generated by a company was 65. The most was 110." Jenkins adds that the funding secured recently will enable Topeka to launch 50 more innovation programs over the next 24 months. "We had Doug Hall, leader of the Innovation Leadership Institute and creator of the Eureka! Ranch, lead a three-day workshop of 130 participants in Topeka. It was intense and very productive," says Jenkins. "Hall believes that the future of the American economy will be built on innovation in manufacturing." The grant comes at a time when Kansas is gaining national recognition for its improved business climate. Forbes magazine reported Oct. 15 that Kansas ranks 10th on the publication’s annual "Best States for Business" report, up five spots from last year’s rank. The state scored especially well on its regulatory environment and economic climate, ranking 11th and 13th, respectively, in those categories. Kansas also ranked 18th in labor supply, 23rd in business costs, 27th in quality of life and 30th in growth prospects. The Forbes ranking compiles data from 10 sources, including Moody’s, Economy.com, Pollina Corporate Real Estate and the U.S. Census Bureau. Earlier this year, Site Selection named Kansas the 10th most competitive state in the nation, based upon actual corporate project performance plus data on job creation and GDP. 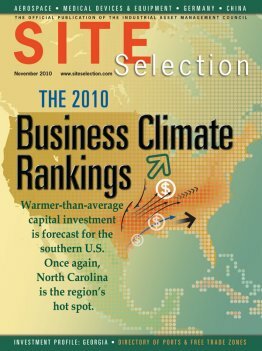 After not placing in the top 25 state business climates last year, Kansas was named the 13th best business climate in the nation this month by Site Selection. This investment profile was prepared under the auspices of GO Topeka, a division of the Greater Topeka Chamber of Commerce. For more information visit www.topekachamber.org or call Steve Jenkins at (785) 234-2644. Security Benefit Life Insurance Company is one of the largest employers in Topeka. The firm was recently acquired by Guggenheim Partners and other private investors for $340 million.